Once upon a time, we were all having the most fun ever, in Austin, Texas, playing mudfootball! Everyone got to play. We took turns. No one got hurt. It was great. It was a happy time. Everybody wins in mudfootball! 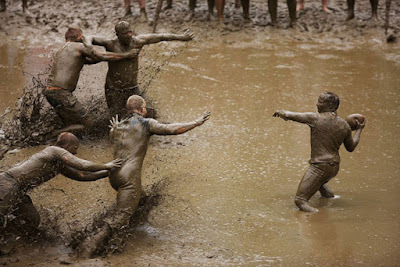 But a couple of kids didn't like some of the rules of mudfootball, so they suggested changing them. We all listened to their new proposed rules, and put it to a vote. Some players (like me) were cool with the new proposed rules, but after the vote, it turned out that the majority preferred the existing rules. So a few of the kids got mad and left :-( But more than just that, they were sort of bratty, and they took their football with them. Hopefully the mad kids change their mind and come back and play! Otherwise, I guess we'll have to go find a new football to play with? (3) placards marking a car as an Uber/Lyft vehicle. That's pretty much it. Please come back, Uber and Lyft!